It started, fittingly enough, with a walk for hunger—one of those community walk-a-thons that raises money for local food banks and overseas charities. It was a nice autumn day, clear and bright, the red and green leaves of the dogwood tree glowing like stained glass and the sloping bank out front foaming with autumn clematis. Skye and I sat on the steps and waved to the hundreds of people in their matching t-shirts as they walked past the house, laughing and talking and waving back to us. Someone must have arranged for bagels to feed the walkers as they assembled for the opening speeches in the ballpark. In any case when it was all done there were a lot of bagels—a lot of bagels—left over, and somehow the bagels ended up in our kitchen as a donation to Food Not Bombs. Bagels. I don’t know if modern childhoods are still haunted by “The Dog of Pompeii”, but my 1950s childhood certainly was. It’s the story of a blind orphan boy living with his dog Bimbo on the streets of Pompeii. On the day Vesuvius erupts the two are separated; in the terror and confusion of the moment the boy is swept into a boat, but the dog runs back to the market to get his young master a raisin bun, is trapped in the falling ash, and loyal to the end and struggling to return, dies. Centuries later archeologists make a plaster cast of the dog, preserved forever with a plaster bun in its mouth. For a nine- or ten-year-old reader it’s a first powerful introduction to heartbreak. 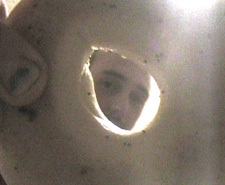 The boy and the dog and the plaster bun come back to me every time I see a big of bagels. Bagels inevitably and rapidly go from less-than-fresh to stale to hard as plaster; when they’ve gotten to the plaster stage there’s nothing to be done with them but throw them away. That’s exactly what we thought we were going to have to do with the walk-a-thon bagels, until Mark came up with a different idea. Carrot, who was living in the house at the time, made some phone calls. 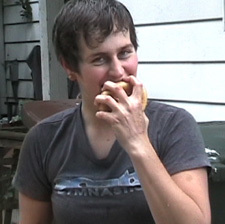 Yes, her gardening friends said, bagels should make fine mulch. I was surprised to hear that—in my limited composting research I had read that baked goods shouldn’t go into the compost pile. 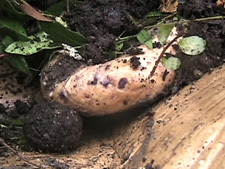 “That’s just because they can attract rats and mice,” Carrot said. “But if you make bread soggy and mix it with other things it’s not a problem.” Bread, it turns out, is actually good for the soil—it’s high in nitrogen (so are some other unexpectedly compostable things like tea bags, coffee grounds, egg shells, human hair, and vacuum cleaner dust). Nitrogen is one of the three essential “macronutrients” that make up commercial fertilizers (the other two are potassium and phosphorus). Plants need nitrogen to make amino acids, protein and DNA; they can’t grow without it. Cool. 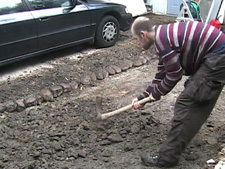 The first step was to clear the gravel out of the driveway and pick-axe out the half-dead rose bushes. The next step was to put down cardboard—cardboard not only discourages weeds, but as it breaks down it actually attracts earthworms who like its biodegradable glues and sugar. Lapped over each other, the variously sized pieces of corrugated cardboard looked like a giant abstract painting. 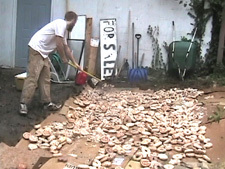 The bagel-mulching day was rainy. Every trash can and plastic bucket in the yard brimmed with bagels and water that dripped down from the gutters; the bagels looked like giant Cheerios sogging in a bowl. When they had begun to soften and fall apart Mark, Carrot and Naman sloshed them out onto the cardboard and spread them around. Next came a layer of green stuff—weeds and leaves pulled up from around the property—followed by a layer of composted soil, forked up from the old compost pile behind the garage. We had all but abandoned the compost pile a couple of years before because of a sudden invasion of rats—but that’s another story. The pile’s remnants supplied us with good rich dirt. After that came a second layer of cardboard. A friend had told us about a landscaping company that had moved, leaving behind giant piles of wood mulch. 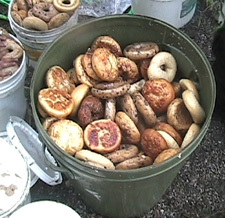 Mark filled his truck up several times with the well-composted mulch and spread it over the garden, which now rose a good foot above the original layer of bagels and cardboard. The final layer was leaves, salvaged from the bags our neighbors had left out by the curb for pick up. 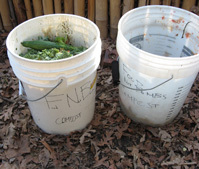 All winter we continued to add leaves; every time the compost bucket in the kitchen filled up we took the scraps out, scatter them in the garden and cover them with more leaves. And it worked. The tomatoes we planted the next summer could not have been more different from the droopy, anemic plants of my previous gardening experience. Suddenly the garden was filled with big muscular plants that looked like forerunners of a new backyard Paleozoic age. On late summer afternoons we would stand around in the garden eating beans and tomatoes straight off the vine. We never went back to traditional composting. I don’t think we ever will. The fall after the bagel mulching experiment Mark put in two more garden beds in the back yard, piled and repiled with leaves. 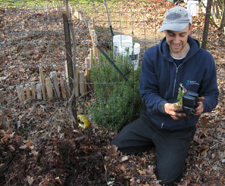 “Sometimes I’ll turn over a piece of soil writhing with so many worms it takes my breath away,” Mark says. 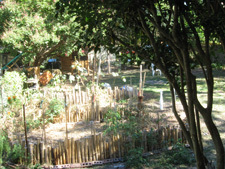 We’ve extended the technique to include the far back yard; the buckets of scraps I bring home from Food Not Bombs go under the leaves and disappear within days into the dark rich soil. Last fall I began on the front yard: cardboard and newspapers, scraps, leaves, more scraps, more leaves. I’m not even sure what’s going to get planted there. I just like mulching. Who knows if we’ll ever have to depend more heavily on our yard for food; who knows where the world is headed. But whether we do or not, there’s a primitive satisfaction in knowing that little by little, bagel by bagel, we are making deposits in an account that will pay dividends for a very long time.